On recent expeditions to research an article on the best addresses in Montreuil I discovered the lovely cafés, restaurants, and community resources this charming suburb of Paris has to offer. Montreuil has a rich agricultural history, having once been the site of many market gardens and orchards growing the famed Montreuil peach. 35 hectares of peach orchards still remain and have been preserved and protected by the association "Murs à Pêches" where you can visit and delve yourself in the city's agrarian past. While most of the market gardeners have disappeared and Montreuil is now becoming more known for it's craft beer, with fantastic local brewers Deck & Donohue and La Montreuilloise, than it's locally grown produce there are still a few treasures to be found at the central Marché Couvert de la Croix de Chavaux. Open on Thursday, Friday, and Sunday mornings, the market is home to a mashup of faux bling jewelry, tawdry textiles, and a few vegetable stands in between. It's easy to spot the good stuff among the industrial and I headed straight to a small table of earth-covered veggies that could only be home grown. The small selection included root veggies, herbs, and beautiful bright green zucchini. I recognized this as the stand that my friend Romain had been telling me about. Though usually run by a woman, on the day I visited it was her father behind the stand. He was smiling and helpful as he picked out two lovely zucchini to go with my fresh bunch of peppermint. Marché Couvert de la Croix de Chavaux is a great spot for fresh herbs such as mint, cilantro, and parsley and unbeatable prices. Add to that whatever extras you can pick up from the remaining market gardeners in the area and you'll have a true taste of Montreuil! Picnic season is upon us and now that the sun is shining we want to get straight to the closest bit of grass or park bench that we can find. During this season, normally modest Parisians have no problem baring their skin and stripping down at the first site of sun, which makes for a whole different kind of people watching during the warmer months. Rolled up sleeves, exposed midriffs, pants secured well above calf level- it's a veritable flesh fest and anyone who has lived a calendar year in Paris knows why- in this beautiful, grey city, there is nothing as precious as a ray of sun. It goes without saying that during these sunny days you have no time to waste between picking up your crudités and finding a decent bottle of rosé or bière blanche. Thankfully there's your friendly neighborhood market, of which a handful offer not only a selection of fruits and vegetables, but also bottles of picnic-appropriate booze. Armed with a trusty corkscrew and these five addresses, your picnic season is guaranteed to be a success! Marché Président Wilson: Not only is this market home to two local farmers (including superstar producteur Joël Thiébault) here you can also find a stand selling a selection of wines, some are even natural/organic! Pair your rosé with some of Thiébault's heirloom carrots and radish varieties and you'll go down in picnic history. Le Parc: Trocadéro Gardens- you're already this close to La Tour Eiffel you might as well just soak it in. Head to the bit of greenery on opposite bank of the besieged monument, where you're close enough for an excellent view, but far enough from the mob to (hopefully) not have your cellphone or wallet stolen. Marché Bourse: This is a handy market if you're prone to get a late start. One of the few markets that are open late, Marché Bourse is great for hot food (it's a favorite lunch spot for people who work in the neighborhood) and organic wine. Don't get your hopes up for fresh produce at this farmer-free market, but you're guaranteed to find a bottle that will suit your picnic needs and a hot lunch to go with. Le Parc: A bit of a trek, but worth the trip, Tuileries Garden is a perfect spot for a picnic. Pull up a chair near one of the fabulous fountains or find a more intimate spot in the statue-filled gardens. Marché La Chapelle: Marché La Chapelle, or "Marché de l'Olive" as locals call it, is the former home of the now brick and mortar En Vrac which has moved just down the street, onto the place that extends the reach of this popular neighborhood market. Here you can fill up a reusable bottle of wine (added benefit: no need for a corkscrew!) or buy a more traditional bottle. All wines are natural and exceptional. Le Parc: Grab a bike and take a quick ride to the Parc de la Villette, whose huge expanses of grass are host to a variety of happenings during the spring and summer months, including outdoor concerts, open-air cinema, and other cultural events. Marché St. Quentin: This covered market, which is open both mornings and into the late afternoon, has everything you need for an ethnically diverse picnic, with the Italian deli counter and Portuguese specialty stand standing out as particularly interesting self-catering options. The market is also home to Bierissime a cave à bière stocked with domestic and international craft beer. Le Parc: Formerly a part of a convent and hospital, the Jardin Villemin is now a public space located next to canal St. Martin. The garden contains a shared community garden as well as a diverse collection of tree and plant varieties- an oasis of nature amidst the train stations and street traffic of this busy quartier. Marché Baudoyer: On Wednesdays Marché Baudoyer stays open until dusk, leaving you plenty of time to visit central Paris and then pick up picnic provisions before the sun sets. Home to one wine vendor, who has a selection of natural wines, the market also serves portions of paella, crêpes, and other street food that will pull together your picnic. Le Parc: It's not technically a park- but you can't be this close to the Seine without having a picnic on its banks! Head to the closest quai or make your way to the Ile St. Louis and join the satisfied sunbathers as they enjoy a hard-earned spring. This month's Marché is a bit special because it's occurs only once a year. So if you missed the Marché des Producteurs in Paris this year, I hope I can encourage you to visit it next year. Held annually at about the same time (early December) the market takes place in the charming Village St. Paul (Paris 4th m° St. Paul). French producers from various regions around the country, such as Dordogne, Charente, and Perigord, come to sell mostly canned, preserved or dried goods. While there were a few fresh items at the market, like vegetables and cheese, many displays included bottled and canned items that are fit for the holidays, either on the table or as gifts. One particular vendor caught our eye with his much appreciated vin chaud and later with a bottle of his tasty merlot/cabernet sauvignon mix. A product of winemakers Denis and Vincent Benoit in the Charente region, this wine was a real find and reminded my a little of the Californian wines I love to enjoy when I'm visiting my family. When I got home I was dissappointed that, in typical French fashion, these great wine producers have nothing in the way of a website and hardly anything ressembling an internet trail. While I believe in letting the wine speak for itself, I am glad that they do some marketing and asked me to put my name on their mailing list, I hope to hear from them in the near future, and I'll let you know where to find there wines once I figure it out! 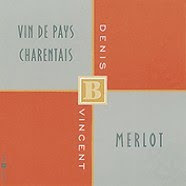 Denis and Vincent's wine has largely affordable price tag (4.50 euro for their Merlot and their Merlot /Cab mix) and a well-balanced flavor which makes their product not only a trésor du marché but also a testament to the Marché des Producteurs itself. Despite the chic neighborhood where the market is held, the producters alter nothing with regards to price and product, everything is affordable and of good quality. Similarly, we had the pleasure of taking home chèvre made from organically-fed goats in Dordogne. For 2 euro each, both fresh and aged chèvres were a delicious companion for our wine selection. While I stopped filling up my basket at that point, meat eaters can be assured that there was enough fois gras, confit de canard, and meats of all sorts to keep you stocked for tho holiday season. The Marché des Producteurs is a great spot to pick up authentic French specialties as well as meet the people who make them. Include this Marché du Mois in your plans for December 2011, I'll be sure to remind you the next time around! Early December- Fri., Sat., Sun.